It’s not a crystal ball, it’s a Crystal Gayle. Los Altos vs. El Dorado, at Valencia HS (Placentia), 7:30 p.m.
Covina at Oak Park, 7 p.m. PLEASE NOTE: Covina’s kickoff is at 7 p.m. … don’t be late! Duarte vs. Verbum Dei, at Centennial HS (Compton), 7:30 p.m.
Charter Oak at Trabuco Hills, 7:30 p.m. This division is so random. Southwest Divsion: The Real CIF: OMG, the Southwest Division is so hard to follow. It totally makes me want to text message Coach Farrar and find out why Trabuco Hills wants to hook up with Charter Oak after hooking up with West Covina and Tustin. And did you see the way Coach Gano was acting on Tuesday? It was like so weird. I think something is up with him and El Dorado. He like totally used Foothill and now he wants somebody more popular. It’s so random. The SGV is so full of players. I hate it. I’m so totally done with this division. I wish the SGV would just win it and go back to that smoggy Valley with the trophy. Coto De Caza has nothing on the exclusive Charter Oak section of Covina. Aram’s semi-normal take: And so it is, the Southwest Division has come down to four teams – two from the SGV and two from the OC. This division has seen both regions fire their share of salvos. Boom! South Hills hit first by dropping seeded Canyon of Anaheim in the first round. Boom! The OC responded by sending Trabuco Hills to West Covina to tame the Bulldogs. They did it. Now, after a little cannibalism, it’s come down to four. No more Yo Momma jokes, it’s time to settle it on the field. Both games are in the OC. Los Altos won’t have to go too far in. Not far enough that the LA cheerleaders will have to fear Cameron’s charm. Charter Oak, on the other hand, that’s a different story. CO moms, guard your husbands. You never know when one of the Real Housewives of Orange Country will set their eyes on him. Hey, SGV men are some of the most appealing in SoCal. And from what I hear, the OC is a great place to spend your mid-life crisis. Obviously, everybody in the SGV would like to see LA and CO win and turn this into a locals only affair. But there’s a good chance the OC could kick us out of Disneyland and settle it amongst themselves in a week. Or, it could come down to one team from each region playing for all the beach sand and smog in SoCal. We’ll see … GET OUT TO A GAME!!! Click here and then click on the link to see it. NWA is nice, but whatever happened to Fila Fresh Crew? 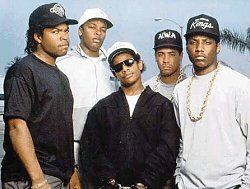 But first, one of Aram’s thoughts: As a chubby, half-white/half-Armenian kid growing up on the outskirts of San Marino, I couldn’t help but feel like NWA’s hit album “Straight Outta Compton” was made just for me when it debuted in 1988-89. Finally, no more Al B. Sure or New Order. I felt like Yella, Eazy and Dre were saying the things I just couldn’t. They were telling it like how it really was on the streets. I just felt like shouting out “That’swhatI’mtalkn”bout” when I heard that album. And then to hear former San Marino football standout Matt Solomon yell “Straight Outta Compton” while warming up for a Huntington Jr. High track meet, it was a sign that finally the message of the streets was being heard. It was really very moving. Because of that, each time Compton is mentioned, a certain part of me has to pour some out for the pioneers of Rhythmic American Poetry (West Coast stylee). Compton pertains this week because that’s where the Duarte Falcons will be playing Verbum Dei in the semifinals of the Mid-Valley Division playoffs. We don’t yet know if it will be at Centennial High or Compton College. But it don’t matter, does it? In addition to knowing it was the berth place of NWA, here are some other things you should know about Compton. Racial breakdown: Latino 56.8%, Black 40.3%, White 1%, Island 1.1%. Slightly more chicks than dudes in Oak Park. Aram funna get there early! Dang it, Coach Thomas. Where the heck are we going? All you need to know about Oak Park. Covina, it isn’t.